Ben Jordan's cases keep getting bigger and more challenging. The same holds true for the experience had by the player as well. The third case, The Sorceress of Smailholm, is certainly both those things, and a lot more. The game follows Ben's first case outside of the United States. He receives a call from a man from a small town in Scotland. His two daughters have been murdered, and it's believed that witches were involved. Ben once again meets an eclectic group of characters, including, for the first time, someone who is actively working against Ben because he doesn't believe in the paranormal. As this game was created after the deluxe versions of the first two cases, and since this game doesn't have a deluxe version, there are some noticeable differences here. The biggest difference is the lack of speech. The game is presented entirely in the fashion of the first two games with the speech pack disabled. The text depicting the speech of the characters is presented next to close up portraits of the characters in question. The description text is presented in a black box in the middle of the screen. The second most noticeable difference is in the character's portraits. Instead of being designed somewhere in between cartoonish and realistic, the character portraits are heavily cartoonish. Somewhat surprisingly, they still do fit in with the realistic style of the background art, but they are a bit jarring if you're used to the deluxe versions of the first two cases. The other differences are more minor, from the different art of the icons, to the sound effect that is used when you gain points. The latter is specific to the monsters of the case Ben's working on, rather than the growl sound effect used in the deluxe version of the first two cases. The presentation has improved upon even the deluxe versions of the first two games in other ways. The start of the game is presented with a cutscene, complete with credits, instead of just starting with Ben at the telephone receiving a case. The latter is still there, but it acts as an after-credits sequence rather than the intro. It's a more theatrical approach, and fits well, considering that the over-arching storyline of the series seems to be picking up steam here. The music is also given a similar uplifting treatment. It is also presented in a more theatrical style, with an almost orchestral feel. The theatrical feel also extends to the closing credits, and ends with a note on how Ben feels about the case. There are two different endings, depending on a condition near the middle of the game. They could be considered "bad" and "good" endings, as one ending leaves questions unanswered and doesn't give the optimum amount of points available. However, neither ending dramatically changes the final outcome of the game. The game's puzzles have been improved upon as well. The puzzles are more challenging this time, and harken back to the Sierra games of the 1990's even more so than previous installments. Despite the challenge factor, they are still quite fun. There is one puzzle in particular that can be solved using the game's manual (found in the installation directory). This kind of puzzle solving has been fazed out over time, but it's still fun if done right. Thankfully, Sorceress of Smailholm does just that, as the use of the manual is completely optional. Ben Jordan's cases keep getting better as they go on. That once again rings true with The Sorceress of Smailholm. As the game never received a deluxe version, there is no voice acting this time around, and there are noticeable differences in the art style. This is offset by the improvements in the presentation of the rest of the game's aspects. The storyline is bigger than before, and it is much more interesting as well. The characters are much less one dimensional now, and the villains are more cunning than before. The music and cutscenes are presented in a much more theatrical feel, adding to the bigger feeling of the scope of the game compared to earlier cases. Despite the lack of voice acting, Ben Jordan Case 3 is truly the best yet, which is impressive in a series where each game has a place among the best free adventure games I've played. In The Lost Galleon of the Salton Sea, the paranormal investigator's second case, Grundislav Games takes every thing that worked well in the first case and expands on it, making a much bigger adventure for Ben Jordan to experience than before. The case takes place less than a week after the last one. Ben Jordan receives a call from a woman in California. She informs Ben that her husband went missing when looking for the Lost Galleon, a Spanish treasure ship that was fabled to be at the bottom of the Salton Sea. The game takes place in and around a small desert town. There are shops for Ben to visit, items that he can purchase, and employees and customers to whom he can talk. There are also surrounding areas he can visit. Some are nearly ghost towns, and others have their own set of colorful characters. As with the previous case, the people that Ben will meet are quite an interesting sort. They are once again voiced well for a free adventure game, with no real standouts as being overly irritating. The voice of the old prospector is close, but his voice grew on me with time. There is no voice for the narrator this time. Descriptions of objects are now presented in plain text in a black box in the center of the screen. The music is also well done, with a nice set of songs that fit each of the game's locations. Once again, there is no way to get voices and subtitles on the screen at the same time. The only way to get subtitles on the screen is to turn off the voice pack in the setup program. There are no overly quiet characters this time, so it shouldn't be an issue for most, but for those who have a hard time hearing or those where English isn't their first language, it will likely be necessary. Like the last game, however, the story is interesting enough to hold your interest even without voice over work. The game uses the same visual style as the last, with realistic backgrounds that look nice despite their early 1990's era resolution, and pixelated character sprites that are evened out by detailed character portraits that are a mix of cartoon style and realistic. 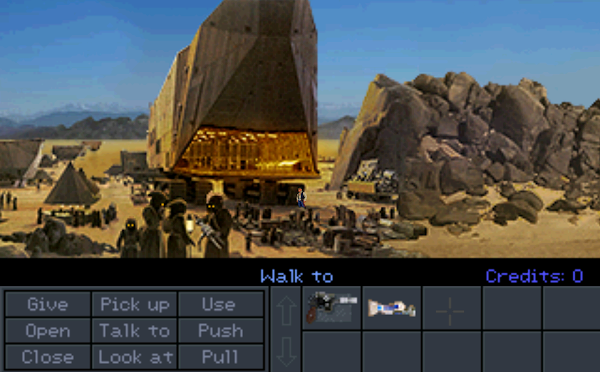 The game uses the same Sierra style interface as the last, with the actions selected by the top menu bar or by cycling through icons with your right mouse button. The top menu inventory and helpful notebook icon where you can check Ben's current task return as well. The game does make an improvement on the map over the last. Instead of having to select the map from your inventory, you simply leave the area. This is more in line with most adventure games with map-based travel, and is a much easier way to navigate. The puzzles inventory based puzzles are just as interesting as the last game. There are some new styles of puzzles here, and once again the puzzles that go outside the box were my favorite. There is one puzzle that goes beyond real world logic, but as this is a series featuring the paranormal, it works well when you put your mindset in the game's world. There is a puzzle that I quite enjoyed that is reminiscent of a puzzle in Telltale's second Bone game, which would be released a few years after this case. The second case of Ben Jordan: Paranormal Investigator is an improvement over the already impressive first case. The deluxe version is definitely the version to get, as it adds several things to the overall experience. There is more area to explore, the voices are performed slightly better this time, the inventory-based map is replaced with a much easier to use system, and there is more music since there are more locations. The puzzles are fun once again, with the puzzles that think outside the box being the standouts. The game's only real flaw is the same as the first, in that there is no way to have subtitles and voices on screen at the same time. However, the game's intriguing story is enough to keep interest even without voice work. Like the first case, Ben Jordan: Lost Galleon of the Salton Sea is one of the best free adventure games that I have played. Ben Jordan: Paranormal Investigator finally concludes after nine years of investigating the paranormal, as Ben Jordan: Case 8: Relics of The Past is out now. The game reconciles the events of the previous case, as Ben searches for the truth in the past and present in an effort to confront the mad man that threatens his future. All eight cases are available for free. However, the author accepts Paypal donations if you enjoyed the game and wish to show your support. Doctor Who: The Adventure Games series two was announced shortly after series one ended. It was advertised to be a "bigger and better gaming experience" than its predecessor. This turned out to be partly true. Series two wasn't bigger than the first, as it ended up consisting of only The Gunpowder Plot. However, it definitely was a better gaming experience. The story is the most intriguing one out of all of the Doctor Who Adventure Games episodes released. It's nuanced enough with enough twists and turns that it could have easily been used as one of the scripts for the television show. Some of the best moments of Doctor Who come from when the Doctor and his companions meet historical figures, and that is certainly the case here. In grand Doctor Who tradition, of course, everything is not as it seems, and classic Whovian aliens are thrown into the mix as well. One of the aliens in the game have not been seen since Tom Baker's time, which should be a treat for longtime fans of the show. These aliens are given the new millenium makeovers that most of the classic Doctor Who creatures have received, but the way they are written is very true to their roots. There is a lot of area to explore here, and a lot of people to communicate with. Never before has a Doctor Who Adventure Game episode felt so lively. The puzzles here are still of the casual adventure variety, but, like the last few episodes of the last series, they are varied and are not repeated as was the case in the earliest episodes. There are also more inventory based puzzles here. There is nothing that will stump any veterans of the genre, but it's nice to see this episode add more staples of the adventure genre into the gameplay. The Gunpowder Plot is definitely the best episode to come out of Doctor Who: The Adventure Games. There is more adventure-style puzzles, the casual adventure puzzles are varied and not monotonous, the storyline is interesting, and the Doctor Who aliens are written to be true to their roots. With the understandable exception of Rory, all the characters are voiced excellently. The music and sound effects, taken from the television series, are once again put to excellent use in the game. Although Series two wasn't as big as was advertised, The Gunpowder Plot definitely ended the adventure games on a high note.